ONE NEWS item that generated very little attention here, but one which will greatly impact the Bicol tourism market in the next few years is budget carrier Cebu Pacific Airway's move to acquire up to 14 brandnew turboprops from the French aviation company Avions de Transport Regional (ATR). This Inquirer story lifted from an Agence France-Presse report is rather staid; the official press release at the Cebu Pacific website fills in the gap. This is a breakthrough that the province and the city should take advantage of; this early, it makes sense for the Camarines Sur provincial and Naga city governments, jointly or independently, to convince Cebu Pacific to prioritize Naga airport in Pili among the destinations for its six firm aircraft orders. 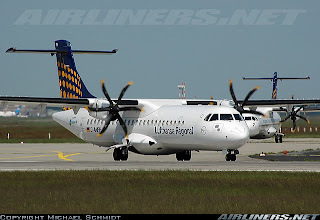 The background info and technical specs on the ATR 72-500 turboprop is available here. Among others, it says this new generation aircraft -- which came into service 10 years ago -- can land and takeoff on a runway as short as 1,079 meters. That would be perfect for Naga Airport's 1,402 meters. If the Gokongwei-owned carrier decides to enter Naga by early next year when the first of these are delivered, that will surely be a boon to local air travelers; airfares will expectedly go down once the Lucio Tan-owned Air Philippines gets a much needed competition. And while jet service has become the standard in air travel these days, a brand-new turboprop will just be as good. Why, even KLM still uses the good old Fokker 50s for its city hopper service to key European destinations out of its Amsterdam Schiphol hub; in fact, that's what we used to connect to and from Cologne during our recent NPM seminar. Actually, come to think of it, what the city and the province need today is not really a new airport (although for the long-term, we should seriously reconsider a longer runway, along the lines of the proposed reorientation project that farmers and vested interests shot down). It is more flight frequency and more competition in the air passenger market. At its peak, the local market can easily support two ATR flights -- one early in the morning and another late in the afternoon. Which means one will be able to fly in and out of Naga, and vice versa, saving visitors hotel bills in the process. Im sure, I can load control one. You can say that again, Nicky Boy. Reminds me of the good ol' days at Naga Airport. But this move by CPA is a dagger thrust on Asian Spirit's heart, don't you think? We could do GSA with CPA, saves them with some troubles. Less organic people for them to take care of. I dont know what Jack Po would say to this?